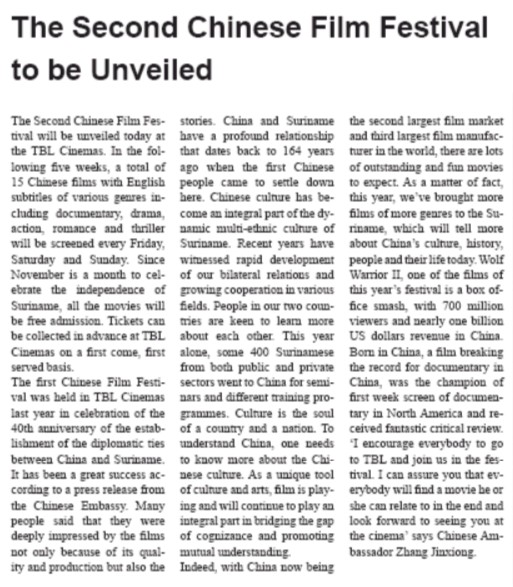 The Second Chinese Film Festival will be unveiled today at the TBL Cinemas. In the following five weeks, a total of 15 Chinese films with English subtitles of various genres including documentary, drama, action, romance and thriller will be screened every Friday, Saturday and Sunday. Since November is a month to celebrate the independence of Suriname, all the movies will be free admission. Tickets can be collected in advance at TBL Cinemas on a first come, first served basis. The first Chinese Film Festival was held in TBL Cinemas last year in celebration of the 40th anniversary of the establishment of the diplomatic ties between China and Suriname. It has been a great success. Many people said that they were deeply impressed by the films not only because of its quality and production but also the stories. China and Suriname have a profound relationship that dates back to 164 years ago when the first Chinese people came to settle down here. Chinese culture has become an integral part of the dynamic multi-ethnic culture of Suriname. Recent years have witnessed rapid development of our bilateral relations and growing cooperation in various fields. People in our two countries are keen to learn more about each other. This year alone, some 400 Surinamese from both public and private sectors went to China for seminars and different training programmes. Culture is the soul of a country and a nation. To understand China, one needs to know more about the Chinese culture. As a unique tool of of culture and arts, film is playing and will continue to play an integral part in bridging the gap of cognisance and promoting mutual understanding. Indeed, with China now being the second largest film market and third largest film manufacturer in the world, there are lots of outstanding and fun movies to expect. As a matter of fact, this year, we've brought more films of more genres to the Suriname, which will tell more about China's culture, history, people and their life today. Wolf Warrior II, one of the films of this year's festival is a box office smash, with 700 million viewers and nearly $one billion US dollars revenue in China. Born in China, a film breaking the record for documentary in China, was the champion of first week screen of documentary in North America and received fantastic critical review. I encourage everybody to go to TBL and join us in the festival. I can assure you that everybody will find a movie he or she can relate to in the end and look forward to seeing you at the cinema.